Comodo Internet Security allows you to run programs inside the Sandbox on a 'one-off' basis. This is helpful to test the behavior of new executables that you have downloaded or for applications that you are not sure that you trust. Browse to the installation folder of the .exe file through Windows Explorer. 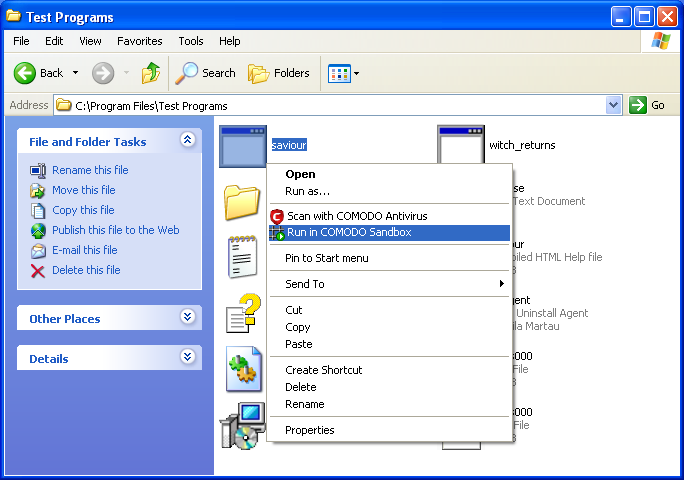 Right-click on the file and select Run in COMODO Sandbox from the context sensitive menu. The program will be started, but will be run inside the Sandbox, with the privilege levels as dictated by settings made through Defense+ Settings > Sandbox Settings.